Click on images to view a larger version. All sketches done during the opera; color added later. Thursday was another press pass night at the opera - dress rehearsal for La Traviata this time. The lighting and sets were really interesting, the live orchestra (music by Verdi) was exquisite, and the story line was suitably tragic. As we are in Quebec, the Italian score is still in Italian, but subtitles posted above the stage are in French. Now, imagine making sense of it all in English! Happily, I was not on assignment, but rather in the company of the writer who was. As a result, I was able to indulge in the details in my own way, and there was no pressure to get a perfect photo in a darkened theater. If you have the inclination, try to find a recording. I don't know if you can find just the orchestral portion, but if so, it will put you in a zen sweet spot. If you have an opportunity, go see it. In Montana, the Roxy Theater in Missoula is part of the Met Live in HD series - they show all the Metropolitan Opera productions live, as part of a nationwide broadcast network. View ticket details or the 2012-2013 Met program for more info. 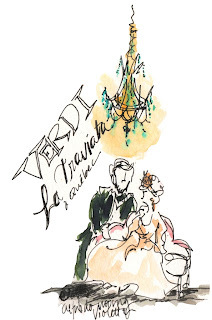 This season includes four Verdi operas (though not La Traviata), along with 8 other operas. 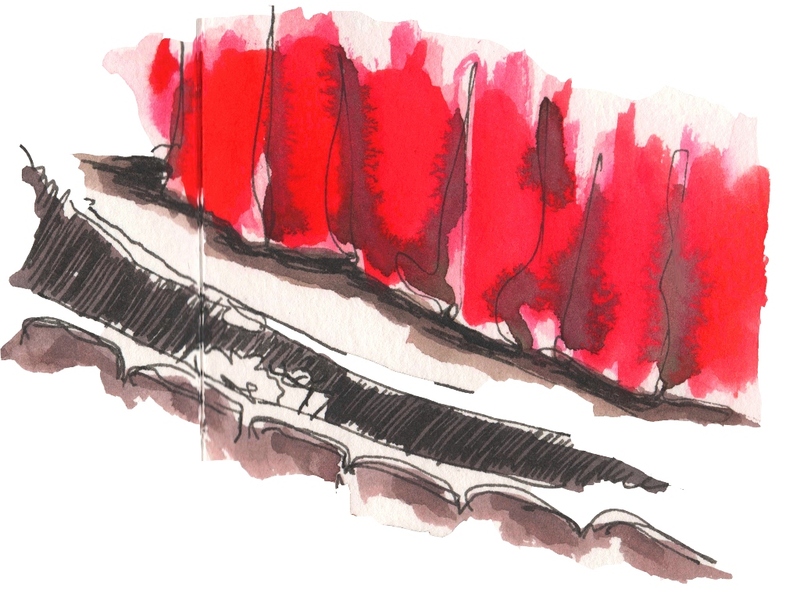 Of course, if you can see through the darkened theater to your sketchbook, draw it! 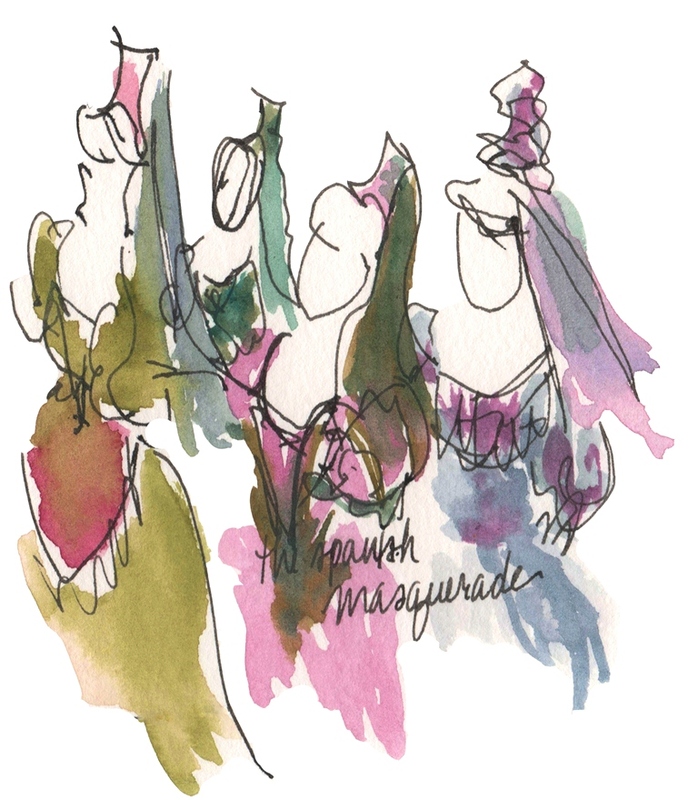 Trying to render live theater is a great memory sketch and blind contour drawing exercise. Stick to pen or pencil, adding color later. Can you imagine what a mess watercolors could be in the dark!? You'll find you observe the details in a very different way than when merely spectating. Sketching this show, even without much light, is viable. The cast is not huge, and the plot is fairly straightforward. Violetta, a Parisien courtesan, learns that young nobleman, Alfredo, has fallen in love with her. The courtesan resists love, wanting to protect her heart and independance, but love trumps her fears. What follows is plenty of intrigue, a duel, a meddling father, tuberculosis, a few comic moments, and a bittersweet finale. 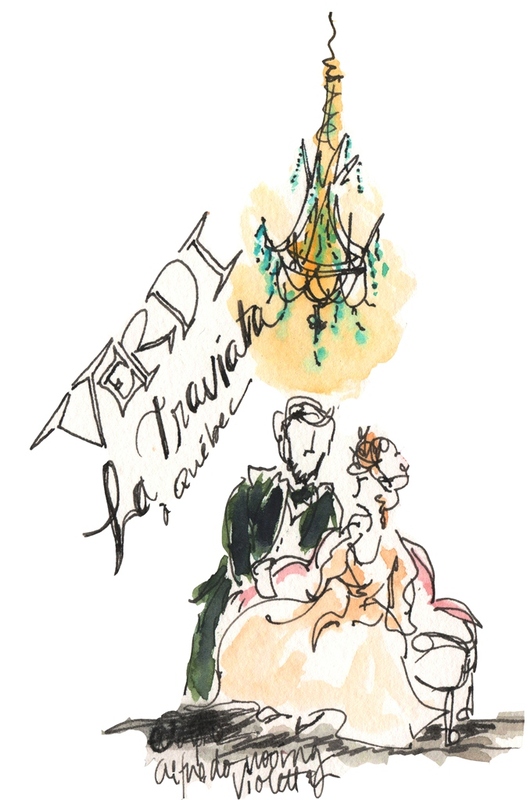 Bottom line: La Traviata offers breathtaking music and many fine opportunities to scribble in the dark. Oh how lovely! You really captured the spirit of the event.